Among the nine laboratories participating in the exercise, representing Australia, Brazil, Canada, the Czech Republik, France, the European Commission (EC), Hungary, the United Kingdom (UK), and the United States (U.S.), the institute demonstrated its ability to perform comprehensive destructive and non-destructive analyses of the high-enriched uranium (HEU) metal samples (of ~92% enrichment) provided by the ITWG. The involved ICP-MS and gamma spectrometry laboratories of the institute’s Department of Radiation Safety provided data results and uncertainties to the ITWG exercise coordinator three times via email. The first assessment, 24 hours after receiving the samples, was primarily focused on categorization of the material and potential hazards posed by the material. These initial data was needed rapidly in order to protect human health and welfare of law enforcement officials and the integrity of nuclear and traditional forensic evidence. The second assessment, at one week, while still preliminary, was more accurate and comprehensive, in order to report the findings to the police, prosecutors, and political leaders. The third assessment, at 2 months, focused on completing a comprehensive forensic analysis and potential attribution of the materials in order to support the legal prosecution of the alleged smugglers. In real cases, it is necessary to provide investigators with as much forensic data as possible to support the investigation and to provide evidences to prosecute the crime. The HEU metal samples were specifically selected to represent high value weapons-usable nuclear materials that proliferators might target for illicit trafficking. The analyses extended to the radiological (dose rate, surface contamination, radiography) and physical characterization (mass, dimensions), microscopy (scanning electron microscopy with energy-dispersive spectrometry), isotopic composition, elemental/chemical characterization (including X-ray diffractometry), age dating of manufacturing, and trace element contents of the materials. The exercise demonstrated that the institute’s capabilities for nuclear forensic investigations are in line with those of other laboratories worldwide. As a joint project in progress between the institute and Paks NPP, a passive non-destructive method for determining the burnup profile of VVER-440 spent fuel assemblies was developed by using high-resolution gamma-spectrometry in a routine way. While the fuel assemblies are sunk down in the loading pit, they are moved to the front of a 1.6 m long collimator built in the concrete wall of the pit in the reactor block and lifted down and up under water for scanning by the refuelling machine. The HPGe detector is placed behind the collimator in an outside staircase. The assay involves scanning the hexagonal assemblies along their length, at 5-12 measurement positions side by side, possibly from 3, 4, or 6 symmetrical sides. The measured axial and radial burn-up profiles are compared to the values calculated at the power plant for reporting the burnup of the assemblies. Excellent agreement was found between the model calculations and experimental data. Assembly groups for measurements are being selected according to their burnup (10 – 45 GWd/tU) and special positions (e. g. control assembly, neighbor of control assembly). The ratio of the activities of Cs-134 to Cs-137 is found to be proportional to the burnup. Activity ratios are evaluated by intrinsic efficiency calibration. Burnup differences are well observable between assembly sides looking at center and opposite directions. Also, burnup profiles are different for control assemblies and normal fuel assemblies. Uncertainty is around 3%. Taking into account irradiation history and cooling time, the ratio Cs-134/ Cs-137 shows good correlation with the declared burnup, computed by using the software package developed at Paks NPP. It is foreseen that the experimental results will be used to further improve the accuracy of the burnup calculation code, thus enabling more efficient use of the nuclear fuel. Some burnup asymmetries measured in the reactor core could not be unanimously explained on the basis of reactor physical considerations. The anomalies registered also by the domestic authority can, however, be interpreted by determining the actual burnup of the assemblies concerned and that of the ones positioned symmetrically with those. The results of the calculations for the average burnup were compared with the results of measurements for examining how they represent the axial and azimuthal burnup profiles of the assemblies. The results of calculations represent the burnup of individual pins of an assembly at nodes of 5 cm height. This means that calculated burnup for an assembly comprise 48 data of the 126 pins each. Burnup asymmetries throughout the core were revealed and interpreted from reactor physical point of view. The objective of this work was to develop a method for verifying the enrichment of fuel assemblies, freshly arrived at Paks NPP, by direct measurement at a random basis. It is essential to be performed at minimal impact on the normal NPP work. For this reason, passive gamma-ray methods were only considered, while carrying out the fresh fuel measurements during the standard procedure of input control of fresh assemblies. All the fresh fuel assemblies entering the power plant are placed on an inspection stand for size check before going into the fresh fuel storage. This circumstance was exploited for conducting gamma spectrometric measurements. Homogeneous and heterogeneous (profiled) VVER-440 fuel assemblies were tested experimentally. A total of 8 assemblies were examined for developing the methods. Four assemblies made of fuel pins of homogeneous composition contained uranium-oxide fuel pellets with U-235 enrichments of 1.6, 2.4, and 3.6 %. In the two types of the so-called profiled assemblies the enrichment of the uranium fuel pins in the central region is the largest (4 or 4.4 %), while it is lower at the peripheral region (3.3 and 3.6 or 3.6 and 4 %). Three gamma detectors were used in the study: two HPGe detectors of different resolution and efficiency and a miniature CdZnTe (CZT) detector, which fits into the central tube (dosimetric channel) of the assemblies. In this way it was possible to obtain information from both the inside and the outside of the assemblies. The assemblies were measured at their half-height by the Ge detectors. The smaller Ge detector had better resolution, therefore it was better for performing measurements in the complex energy range of 90-100 keV, while the bigger detector was used for recording the higher energy gamma peaks. For evaluation of the spectra the MGAU v4.0 computer code was applied. Relatively long (1-2 h) measurements would have been necessary in order to achieve good statistics. Calibration of the equipment was not needed, because of the intrinsic efficiency calibration method used by the code. The applicability of the method was tested in order to obtain enrichment values independent from geometry and calibration. The measurement time was less than half an hour in this case. Detector stand. The fuel assembly is fixed by screws at left. The spectra taken by both Ge detectors are suitable for these studies. The method is based on the proportionality of the 185.7 keV peak intensity of U-235 to the enrichment of the sample. Calibration of the method was made by fuel assemblies adopted as reference assemblies at fix geometry. The dependence on the detector distance was possible to reduce by using the ratio of the intensity of the 185.7 keV peak to that of the 1001 keV peak of U-238, instead of the direct calibration with the 185.7 keV peak only. The relative statistical uncertainty of the intensity ratio of the two peaks was about 1% at these measurements. The miniature CZT detector is inserted in the central tube of the assemblies at 60 cm depth from the upper grid uniformly. The measurement geometry is the same, but measurements are performed in assemblies being in the storing rack as well. Examining the dependence of the peak intensity on the insert depth, it remains constant at 15 cm and more below the upper pellets (at 30 cm and more below the upper grid). Upon testing the method, the homogeneous assembly and one of the types of the profiled assemblies were measured. The results proved that the assembly types could unambiguously be separated and profiled assemblies could also be identified. Intrinsic calibration (GEM MGAU) cannot be recommended for identifying profiled assemblies, because of the long counting time. CZT results do not change, no matter if the assembly is in the storage rack or separated, because of the shielding effect of the fuel pins against radiation from outside. It is the average enrichment of the “visible” pins what is measured by each detector (the pins visible for the CZT detector are in the 2-3 concentric circles surrounding the central tube, or in the 2-3 outer rows when measuring from outside by Ge). By comparing results of the measurements performed inside and outside, the composition of an assembly (homogeneous or profiled) can unambiguously be established. The measurements were performed by locating the Ge detectors either in front of the side plane or of the edge of the hexagonal assembly prisms. The uncertainties are higher when using the low-energy part of the spectrum (evaluation by MGAU), than upon making use of the high intensity 186 and 1001 keV peaks. 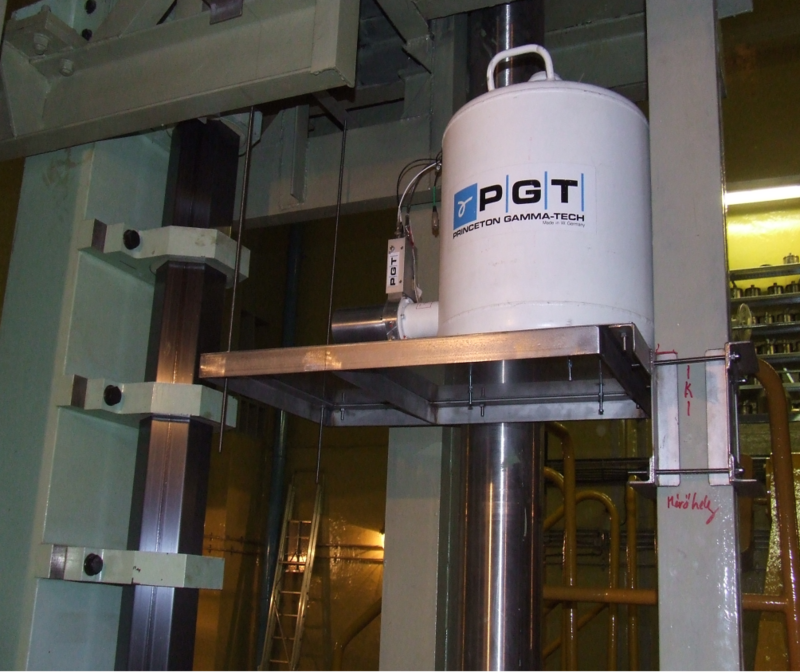 For routine measurements the bigger Ge detector was only used, placed on a console fixed by screws on the supporting pillars in the fresh fuel storage. Measurements relied on the peak area of the 186 keV gamma-ray, using the Ge and the miniature CZT detector. Out of the 80 fresh assemblies of the last shipment, 13 were verified. Three of them were of homogeneous (1.6, 2.4, and 3.6% enrichment) and ten of profiled assemblies, two of which were of 3.8% enrichment (on average). The average value of the outer 2 rows is 3.55%, while it is 3.68% for the outer 3 rows. The measured value should be between these values, whereas the inner measurement should result in 4%. The other 8 profiled assemblies were of 4.2% enrichment each. The average value of the outer 2 rows is 3.89%, of the outer 3 rows is 4.05%. The inner pins are of 4.4% enrichment, except for three ones of 4% (loaded with Gd). The average of the 2 inner rows is 4.33%, of the 3 rows is 4.36%. The results agree well with the nominal values within uncertainties. Different assembly types can be clearly distinguished. It is foreseen that this procedure will be used as a routine method in the next years. Testing the fuel, whether or not is being made of reprocessed material, is based on the fact that the isotope U-232 does not occur in nature. It is produced during irradiation of the fuel in a reactor. It is to be noted, however, that minor quantities of U-232 can already be found in the enriched uranium even not reprocessed, because practically all the enrichment facilities are contaminated by reprocessed material. The U-232 abundance is, however, an order of magnitude higher at least in reprocessed fuel, than it is in the fuel of the same enrichment, being made of not reprocessed material. It was proved that the U-232 content in the measured assemblies was much less than in reprocessed fuel. Thus, the fuel can be tested for containing reprocessed material or not. If U-236, being important in view of reactor physical calculations, is present, it can also be estimated on the basis of the U-232 quantity measured. In addition, it is controlled simultaneously with the enrichment, in one single measurement. The necessary extra burden to the power plant is minimal, a few hours only. On the basis of the results obtained, the assemblies examined till now were not made of reproceessed material. The SFAT method, i.e. 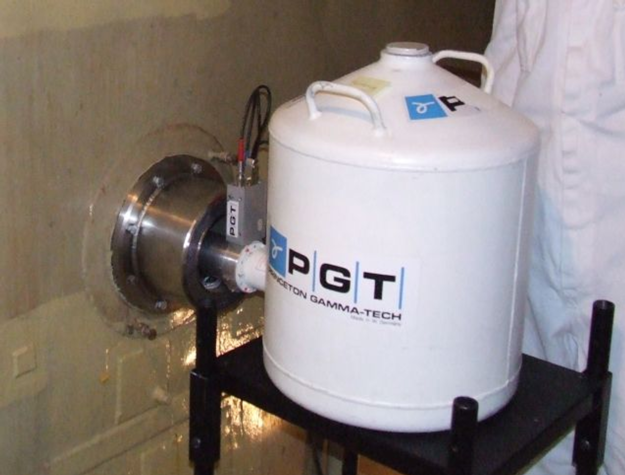 measuring gamma spectra of the spent fuel stored under water is an easy to perform technique for checking the nuclear material content of the assemblies. The apparatus is immersed in water and consists of a 500 mm3 hemispherical CdZnTe detector and a set of tubes of 1 m length. The water outside the tubes serves as collimator. This method can prove the presence of the fission products indirectly, first of all by the 662 keV line of the 137Cs. Fuels with extremely low burnup (order of 1-2 GWd/tU) and/or long cooling time (8 years or more) can be observed, even in the presence of a second (upper) fuel layer in the spent fuel pond. Demonstration of other fission products can improve the reliability of the test. The goal of this study is to investigate the role and the detectability of 134Cs. Visibility of the 796 keV line of 134Cs depends strongly on the cooling time. If the cooling time is less than a year, the peak of the activated Zr interferes with the peaks of both Cs isotopes. The 134Cs line gives information on the burnup of the spent fuel in the interval from 2 to 8 years. The method can be used for revealing undeclared irradiation, whereas verifying that the containers in the spent fuel pond for storing Co-60 sources do not contain fission products, thereby fissile material either. 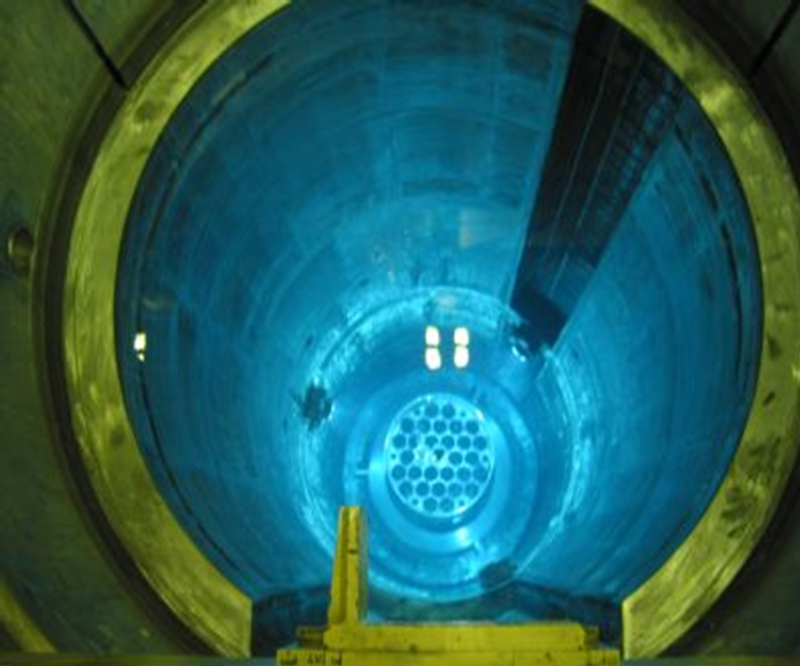 A passive non-destructive method was developed for determining the 235U, total U and total Pu content of 72 canisters kept in spent fuel pond at Paks NPP under IAEA and EURATOM safeguards, containing an inhomogeneous mixture of spent-fuel pieces of different burn-up distributed in an irregular geometry. This kind of material may exist in nuclear installations worldwide, but there is no generally accepted method for verifying its nuclear-material content. Using this method, the nuclear-material content of the canisters was measured, and the nuclear-material inventory of the damaged fuel was prepared and reported to EURATOM and IAEA for each canister individually, in compliance with the requirements of the authorities. The equipment included high-resolution gamma-spectrometry, medium-resolution gamma spectrometry, neutron counting and gross-gamma counting devices. The method was successfully applied for measuring the nuclear material content of the canisters containing debris of VVER-440 fuel. The fuel of 30 assemblies became unusable due to an event in 2003, containing broken fuel rods, as well as pellets and parts of the cladding. The initial inventory of nuclear material in the assemblies (i.e. before they got damaged) was known and documented. In the incident, however, pellets from different types of assemblies of different burn-up and irradiation history got mixed together, and it was not possible separating or identifying them. The measurements carried out could serve as a precedent for inventory-taking of nuclear material in a mixture of different types of nuclear and non-nuclear material distributed in an irregular, unknown geometry. 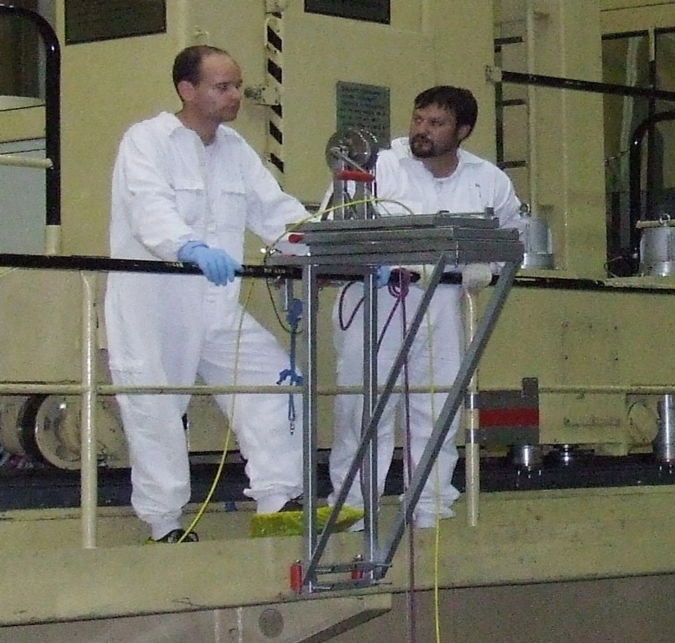 In addition to the nuclear measurement techniques, weight measurements have been performed for each loaded canister. Therefore, an estimated value for the mass of nuclear material based on the total mass of the material loaded into the canisters was also available for each canister. A comparison of the results of the two methods was also given.